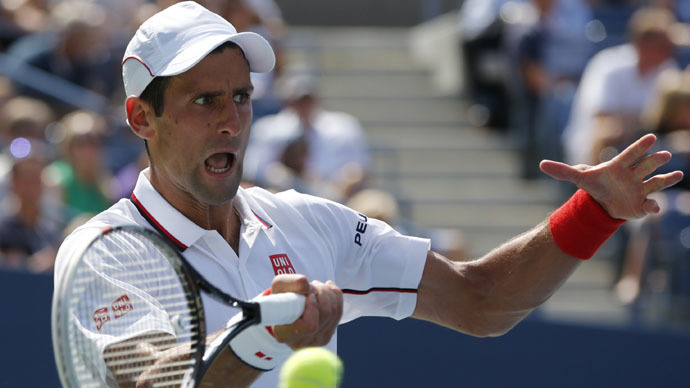 An M1 Abrams tank had an unusual mission, taking on top tennis player Novak Djokovic. In a computer generated video, the machine was given a good workout and needed all its firepower to contend with the 27-year-old's blistering shots. Filmmaker and visual effects expert Michael Shanks was the mastermind behind the video, which saw Djokovic take on an iconic American M1 Abrams tank (which commentator somehow links to WWII)at the Rod Laver Arena at Melbourne Park, after using computer graphics to simulate a match Djokovic played at this year’s Australian Open tennis tournament. The encounter pitched the Serb's excellent backcourt game against the sheer power of the tank, which used its gun to hold the racquet. The 27-year-old certainly gave the metal machine plenty to think about, with a series of cross-court forehands, but the tank's returning game was impeccable. However, it was a different story when he was faced with the tank's rocket-like serve, which was fired straight from its gun. The Belgrade native could only fend these off into the crowd, leading to a certain amount of collateral damage in the stands. While Djokovic may be one of the most sportsman-like players on the men’s tennis tour, the tank would hardly fall into that category; it blew the seven-time Grand Slam winner to smithereens following a handshake at the net. The Serb will be back, of course, and will face Stanislaw Wawarinka in the semi-finals of the Australian Open on Friday, for the right to meet Andy Murray in Sunday’s final as Djokovic looks for his fifth Australian Open crown of his career.